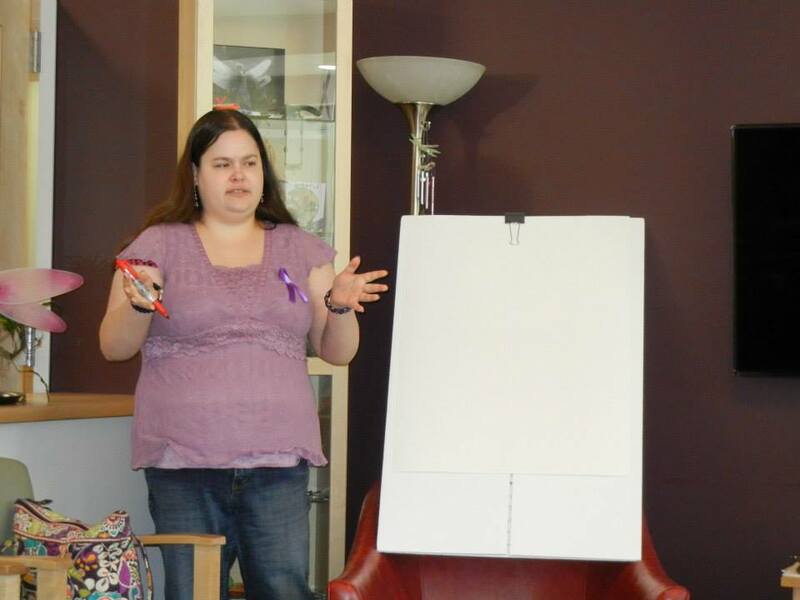 This is a picture of me giving a presentation to the medical staff at my primary care physician’s office. Today is day 23 of our Migraine and Headache Awareness Month Blog Challenge (#MHAMBC). Consider this quote by John Lennon, “A dream you dream alone is only a dream. A dream you dream together is reality.” Now write about this in terms of your dreams. When it comes to dreams, there are many quotes that come to mind, along with the previous one. Quotes like “A dream is a wish your heart makes” (from Disney’s “Cinderella” movie) and “You may say I’m a dreamer, but I’m not the only one” (there’s John Lennon again) and “Now life has killed the dream I dreamed” (from Claude-Michel Schonberg’s “Les Miserables” musical score.) Everyone talks about dreams; everyone has dreams. Dreams can be wonderful, magical, mystical things. Dreams are what we hold onto when all is lost. The difficult part about making your dreams come true is that, sometimes, you need help. John Lennon states this very clearly…you need to dream together in order for a dream to become a reality. One of my most intense and passionate dreams is for a world where migraines are not only curable, but preventable. A world where migraines are not dismissed because they are an invisible illness. A world where migraines are NEVER again seen as “just a headache.” A world where people take migraines as seriously as any other chronic, debilitating disease. I have met some incredible migraine patients along my journey, as I dream my dream. Migraine Warriors, I call us, because we exude bravery and strength and persistence beyond anyone I’ve ever known. But I’m getting frustrated. I feel like I and all of my Migraine Warrior colleagues are dreaming our own dream, only seen to us, hidden away from the rest of the world because, try as we might, we can’t seem to get the general public to share in our dream. I understand that it’s difficult to understand what a disease is like when it’s not staring you in the face every second of your life. But I try to imagine what it must be like for people with illnesses, diseases, injuries, and disorders that I don’t have. I try to support them, to help make their lives less difficult, to let them know that I see them and hear them and that I care. I don’t feel as though the Migraine Community is given the same treatment. Profile pictures aren’t changed, ribbons aren’t worn, donations aren’t made. Oh, sure, people with Migraines do these things. Sometimes, we’re lucky enough to have friends and family who will do them, too. But with over 36 million Americans battling Migraines, I fail to see how we continue to slip through the cracks. All of you reading this know someone who is affected by migraines. So let me send out an SOS, with just one week left in Migraine & Headache Awareness Month: we NEED your help to spread the word. Even if you, personally, don’t suffer from migraines, someone you know does. Is it the 8-year-old boy in your daughter’s class who’s absent every other day because the classroom’s fluorescent lights trigger his migraines? Is it your co-worker that you heard vomiting in the bathroom because someone opted to go a little heavy on the perfume at the office? Is it the mother who doesn’t show up at school events because she can barely lift her head off the pillow? Is it the clerk at the grocery store who wears long sleeves even in the summer to hide the bruises from infiltrated IVs he’s endured at the Emergency Room the night before? Is it your mother, father, sister, brother, wife, husband, aunt, uncle, best friend, girlfriend, boyfriend, partner, boss, colleague? None of these sound familiar? How about this? I spent last Wednesday in the Emergency Room. I was sent there in an ambulance from my doctor’s office, by my doctor, who, by the way, is not an alarmist. I had the most severe head pain I’d ever had, couldn’t keep down liquids or solids, was so dehydrated that I was on the verge of passing out, had an elevated blood pressure, and alarmingly heart rate. Though this attack was the most intense one in recent memory, it is unfortunately not an anomaly. Migraines are routine for me. I don’t view myself as an ill person. I view myself as a person with an illness. My illness does not define me but that doesn’t mean I will ever stop trying to make my dream of a migraine-free world a reality. So now you, personally, know someone with chronic migraines. It turns out that I have another dream: a dream to be seen and heard and supported. That dream has to come true first before my dream of a migraine-free world can begin to manifest. Will you help me make my dreams come true?